224 pages | 16 Color Illus. | 32 B/W Illus. 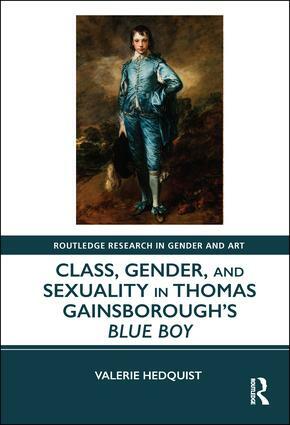 The reception of Thomas Gainsborough’s Blue Boy from its origins to its appearances in contemporary visual culture reveals how its popularity was achieved and maintained by diverse audiences and in varied venues. Performative manifestations resulted in contradictory characterizations of the painted youth as an aristocrat or a "regular fellow," as masculine or feminine, or as heterosexual or gay. In private and public spaces where viewers saw the actual painting and where living and rendered replicas circulated, Gainsborough’s painting was often the centerpiece where dominant and subordinate classes met, gender identities were enacted, and sexuality was implicitly or overtly expressed. Valerie Hedquist is Professor of Art History at the University of Montana, USA. Routledge Research in Gender and Art is a new series in art history and visual studies, focusing on gender, sexuality, and feminism. Proposals for monographs and edited collections on this topic are welcomed.